On Saturday I decided to take Rob to Blackpool as he had never had the pleasure of visiting the retro seaside town! If you have never been to Blackpool before, you must go. Everything you have ever heard about the town, is most possibly true; tacky, crazy, full of families, fish and chips, sticks of rock, sugar dummies, fun fair rides and arcades on a huge scale! But, Blackpool does have a retro charm about it that will always keep me going back for day trips. 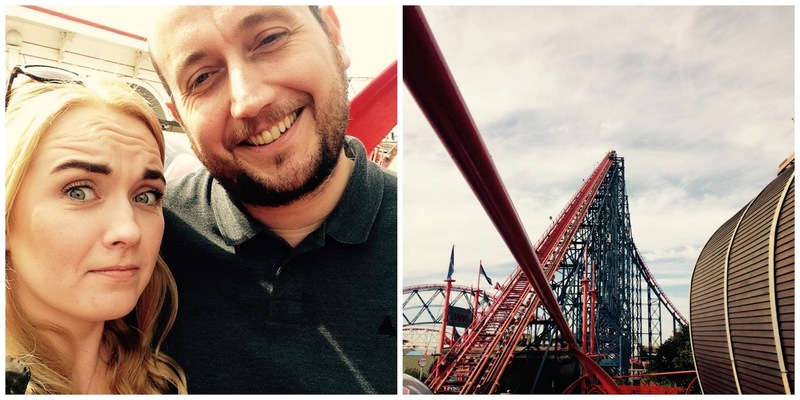 Rob had never been on a roller coaster before, so what did he want to do first.....go on the biggest one in the UK, known as The Big One (The Pepsi Max). I had been on it once before and that was enough for me, but for the sake of love (and I was hoping Rob would be absolutely terrified - I know, I am an evil girlfriend) I went on it again. Rob seemed to have no fear at all as he had nothing to compare it too, where I already knew what I was queuing up for - see picture below! There is a 200 ft climb before you plunge into what looks like the sea and beach, you then continue being thrown around on the rickety old ride with just a bar across your lap, pre-warning for women, wear a support bra if you are going on any rides in Blackpool. We had lots and lots of laughs at Blackpool Pleasure Beach, if you haven't been before, think of an old Alton Towers with some seriously ancient rides one of which, The Grand National, was built in 1935!! I found my competitive side on the Roll-a-Ball Horse Race and, surprise surprise, the person who had never played it before (yes, Rob), won the first game! 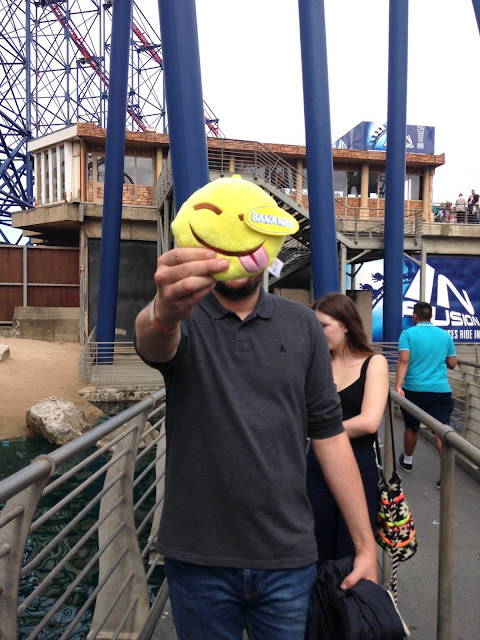 And the prize that seems to be in 'Blackpool fashion' is emoji cushions - my life now feels complete! Blackpool may be known as a crazy seaside resort but it does actually have a lot of history there too. The South pier is 123 years old and has a giant Ferris wheel on it, along with something for the thrill seekers out there, such as a bungee swing and a bungee ball, which we avoided after I went on both of them over 10 years ago, very intoxicated - never again! Blackpool tower is a fantastic place to visit, we didn't get that far on this trip but it's always in sight wherever you are. 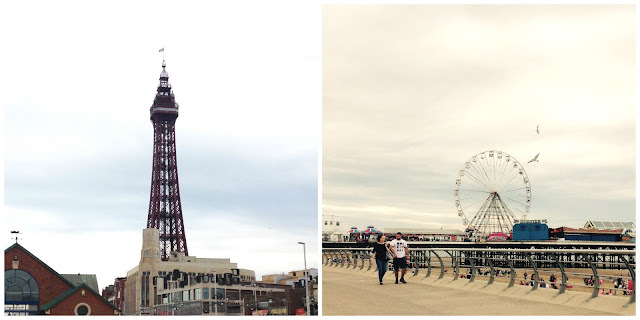 It's well known for it's tower, which has a glass floor to walk over at the top and also it's tower ballroom where the BBC hold Strictly Come Dancing finals, again, this is extremely old, constructed 122 years ago and it marks the centre of Blackpool itself. Blackpool is definitely a fun day out for all of the family. If you can embrace the madness and the tackiness around you then you would definitely enjoy a day trip there. I think if I spent more than 2 days there I would go insane, and I would also spend all of my money of the 2p & 10p slot machines, they are so addictive! Have you ever been to Blackpool? There is NOTHING better than fish and chips on the beach!